With all due respect to Mr. Twain, he didn’t quit hard enough. The successful mantra to kick the habit is, “If at first you don’t succeed, quit, quit again.” Yes, even if you have done it many times before, it’s time to quit once more. Whether you’re a young smoker who smokes to be part of a clique, or a seasoned smoker with smoking medals decorating your lungs, quitting can be tough. But it is not impossible. There are many people I know who have successfully given up smoking and are now living a healthier and happier life. How did they do it? By learning about their options and preparing accordingly. With the right game-plan tailored to your needs, you too can break the addiction, manage your cravings, and join the millions of people who have kicked the habit for good. Listed below are some tips to quit smoking naturally, but before that let me tell you why you should quit smoking. Within 20 minutes: Your heart rate will start to drop back toward normal. 2 hours later: Your heart rate and blood pressure will decrease to near normal levels. You peripheral circulation may also improve. 12 hours later: The carbon monoxide in your body decreases to lower levels, and your blood oxygen levels increase. 24 hours later: Believe it or not, just one day after quitting smoking, your risk for heart attack will already have begun to drop. While you’re not quite out of the woods yet, you’re on your way. 48 hours later: Within 2 days without a cigarette, your nerve endings will start to re-grow, and your ability to smell and taste is enhanced. In just a little while longer, you’ll be better appreciating the finer things in life. 2 to 3 weeks later: For most smokers, withdrawal symptoms start going away at around this time. You’ll be able to exercise and perform physical activities without feeling winded and sick. Your circulation will improve, and your lung function will also improve significantly. Your lungs may start to feel clear, and you’ll start breathing easier. 1 to 9 months later: Your lungs begin to repair. Inside them, the cilia – the tiny, hair-like organelles that push mucus out – will start to repair themselves and function properly again. This will help to reduce your risk of infection. With properly functioning lungs, your coughing and shortness of breath may continue to decrease dramatically. 1 year later: The one-year mark is a big one. After a year without smoking, your risk for heart disease is lowered by 50 percent compared to when you were still smoking. 5 years later: From now to 15 years of being smoke-free, your risk of having a stroke is the same as someone who doesn’t smoke. 10 years later: Your risk of dying from lung cancer will drop to half that of a smoker’s. Then 10 years after quitting, your risk of cancer of the mouth, throat, esophagus, bladder, kidney and pancreas also decreases. 15 years later: Your risk of any type of heart disease will be the same as someone who doesn’t smoke. You’ll no longer be at a higher-than-normal risk for a wide range of conditions like heart attack, coronary artery disease, arrhythmias, angina and infections of the heart. As you can see, the long-term benefits of quitting are incredible. 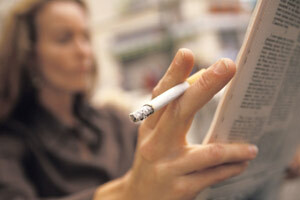 According to the American Heart Association (AHA), non-smokers live 14 years longer than smokers. And as you can see from the above timeline, quitting for over 15 years brings you at par with a non-smoker. So now that you have enough motivation to quit, here are few tips that will help you achieve your long-term “quitting” goals. Make your own personal stop smoking plan: A good plan addresses both the short-term challenge of quitting smoking and the long-term challenge of preventing relapse. It should also be tailored to your specific needs and smoking habits. Take the time to think of what kind of smoker you are, which moments of your life call for a cigarette, and why. This will help you to identify which tips, techniques or therapies may be most beneficial for you. Identify your smoking triggers: One of the best things you can do to help yourself quit is to identify the things that make you want to smoke, including specific situations, activities, feelings, and people. Be as specific as possible. Times, Places, People, Emotions can all be triggers. Eliminate smoking triggers: Once you identify the triggers, try and eliminate them. If alcohol triggers your smoking, switch to non-alcoholic drinks or drink only in places where smoking inside is prohibited. If your circle of friends is a trigger, talk about your decision to quit. Let them know they won’t be able to smoke when you’re in the car with them or taking a coffee break together. In your workplace, find non-smokers to have your breaks with. If the end of a meal is a trigger, replace that moment after a meal with something such as a piece of fruit, a dessert, a square of chocolate, or a stick of gum. Coping with nicotine withdrawal symptoms: Once you stop smoking, you will experience a number of physical symptoms as your body withdraws from nicotine. Nicotine withdrawal begins quickly, usually starting within thirty minutes to an hour of the last cigarette and peaking about two to three days later. Withdrawal symptoms can last for a few days to several weeks and differ from person to person. The symptoms could range from a simple craving and irritability to more serious symptoms like headaches and vomiting. The following chart will give you a fair idea of what to do to overcome these symptoms. Distract yourself.Do the dishes, turn on the TV, take a shower, or call a friend. The activity doesn’t matter as long as it gets your mind (and your hands) off smoking. Get out of a tempting situation.Where you are or what you’re doing may be triggering the craving. If so, a change of scenery can make all the difference. Smaller cigarettes: Cut your cigarettes in half before lighting up. Nicotine replacement therapy: Nicotine replacement therapy involves “replacing” cigarettes with other nicotine substitutes, such as nicotine gum or a nicotine patch. It works by delivering small and steady doses of nicotine into the body to relieve some of the withdrawal symptoms without the tars and poisonous gases found in cigarettes or non-nicotine medications to reduce withdrawal symptoms. Non-nicotine medication: These medications help you stop smoking by reducing cravings and withdrawal symptoms without the use of nicotine. But remember, medications such as bupropion (Zyban) and varenicline (Chantix) are intended for short-term use only. As you can see, there are many helpful ways to quit smoking. But none of these will work by themselves. They are useless on their own. For them to work you need to have a good supply of what I call vitamin W. Commonly known as Willpower. After all, where there is a will, there is a way. In this case, many ways. Kicking the smoking habit could be the best thing you do for your health. Add another negative to the long list of smoking hazards: Poor eyesight. Here’s what you need to know. You’re probably well aware that smoking accelerates aging and damages your lungs and heart, but did you know that it also increases your risk for a variety of bladder problems? It’s true, as disconnected as the two may seem, smoking has a direct impact on the health of your bladder, and the only way to prevent the damage that smoking causes, is to quit smoking and avoid second-hand smoke. Find out more here.